With the increased rows of detector elements from 16, 64, to 256 or even 320, the z-axis coverage of CT scanners increases from 10 mm to up to 160 mm, accordingly. Currently, both Toshiba Aquilion ONE (320 slices) and the recently introduced GE revolution (256 slices) have 160 mm per gantry rotation detector coverage. One challenge associated with the increased wide z-axis coverage is to estimate radiation dose. Conventionally, the computed tomographic dose index (CTDI),, the dose to a uniform polymethyl methacrylate (PMMA) phantom, is used to estimate patient dose when patient size corrections are made (e.g., size-specific dose estimation). CTDI was defined as a single axial exposure to a 100 mm pencil-shaped ion chamber inserted into a 15 cm long body or head PMMA phantom. This definition is accurate for narrow single detectors where the entire dose profile, with scatter tails, is within the collection region of the pencil chamber. As dose profiles get wider due to increased z-axis coverage, CTDI measurements using a 100 mm pencil chamber would significantly underestimate actual radiation dose. Intuitively, CTDI concept can be extended to measure radiation dose from a CT scanner with wide z-axis coverage by simply elongating the ion chamber and PMMA phantom. However, one would have to acquire a 300 mm long pencil chamber. Alternatively, the International Electrotechnical Commission (IEC) has proposed an adjusted definition of CTDI which is still based on the measurements made by a 100 mm ionization chamber., The IEC method is explained later in this article. Another method involving a unified theoretical framework has been proposed, in which the equilibrium dose constant Aeq, as the major product of this framework, can be utilized to achieve a theoretically accurate estimate of the integral dose, expressed as the dose length integral (DLI). This method, however, still requires the use of extended phantoms to allow dose equilibrium to be achieved. This article measures and compares the radiation dose in a 256-slice GE revolution CT scanner using the aforementioned methods: Traditional CTDI with standard ion chamber and PMMA phantoms, DLI from TG111 method, and IEC “scaling” approach. This study is expected to keep clinical medical physicists abreast and informed with respect to this newly introduced GE CT scanner, as well as the measurement methodologies necessary for accurate dosimetry of this and other wide-beam CT scanners. We start with a short summary of the measurements made. A pencil and a Farmer chamber are used to measure dose profile integrals (DPIs) in a 60 cm long body phantom at different beam widths. The dose profiles are integrated piece by piece with these two chambers. The DPIs are used to calculate both CTDIs and dose length products (DLPs). Second, the Farmer chamber is used to measure the peak exposure in a 60 cm body phantom at different beam widths. The maximum or peak dose is obtained by extrapolation of a mathematical formula. The peak dose and beam widths are multiplied to obtain the dose length integral (DLI). Third, a pencil chamber is used to measure different CTDIs according to the IEC method and a DLP calculated, the DLPIEC100. Previous DLPs calculated from the CTDIs initially obtained above are compared to the DLPIEC100. Pencil chamber-based dosimetry integrates an exposure profile f(z) from a single axial rotation about a stationary body phantom at different beam widths. The chamber collects the cumulated dose at z = 0, DL(0), from a single axial rotation for a narrow collimation. Cumulated dose DL(0) becomes the computed tomographic dose index (CTDIL) under conditions stated below where CTDIL is cumulated dose to the central scan DL(0) location for a scan length L. If a 100 mm pencil chamber is chosen to integrate the dose profile over its length, CTDIL becomes CTDI100. For larger multidetector CT (MDCT) scanners or cone beams, since the total exposure profile f(z) in a phantom extends well beyond the beam width set, it is necessary to either have a detector long enough to cover the entire profile or contrive to measure the dose profile piece by piece with a short chamber. When multiple single axial scans are done over a long scan length, the accumulation of the total dose profile is called the multiple scan average dose (MSAD). In this section, the connection of a general dose profile integral, DL(z), equation (1), to the MSAD is expressed. This is described below. For multiple axial scans over a scan length L and table increment b, the expression. where △z is the active length of the detector used for integrating the dose profile. For pencil chamber, △z = 100 mm, and for Farmer chamber, △z = 23.1 mm. This article integrated the dose profiles at each beam width on the CT scanner using both the pencil and Farmer chambers. where the dose profile f(Z) is defined as above, n is number of slices, T is slice thickness, and the integral for nT <100 is done for the smallest available beam width, which is called the reference. 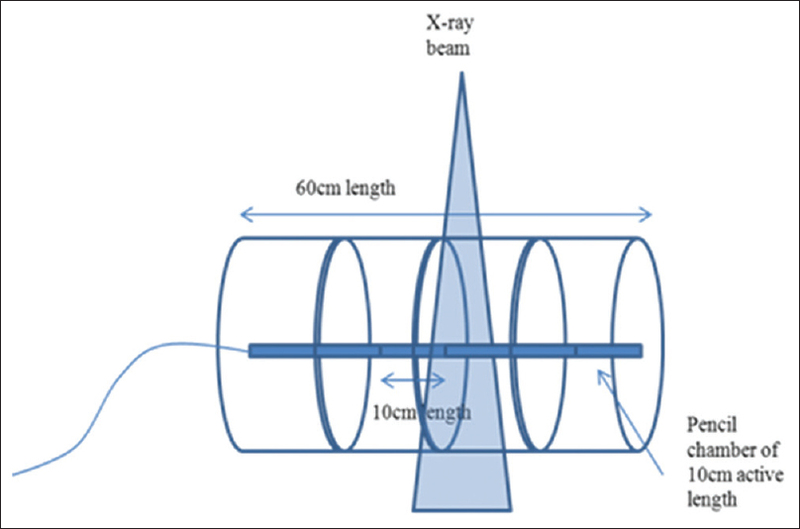 In this paper, a beam width at 5 mm was used as the reference beam width for measurements in air and phantom. where fp(0) is the primary beam intensity, η is the scatter-to-primary ratio (SPR), d is a constant in the unit of mm, and a is the physical beam width. where DLI is the dose length integral (mGy). 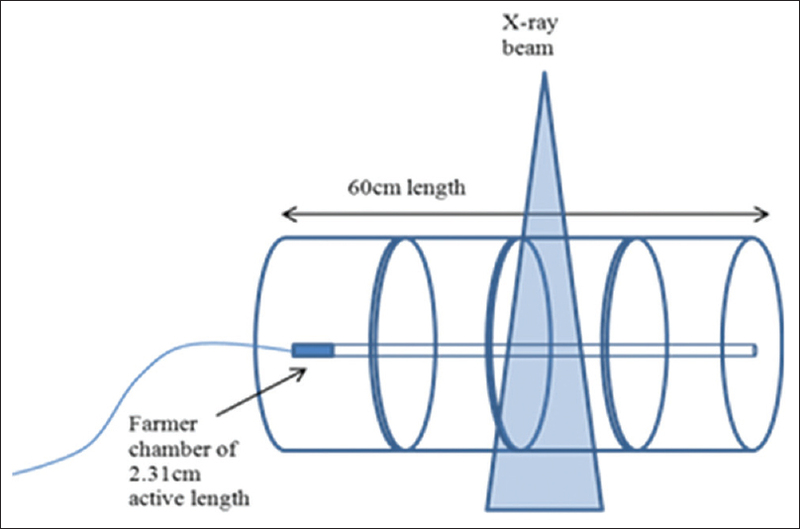 In this paper, a Farmer chamber of 23.1 mm active length and 0.6cc volume was used as a point chamber to collect peak exposures at different beam widths. The data was plotted and Aeq was obtained by using a mathematical model to extrapolate the data to infinite beam widths. 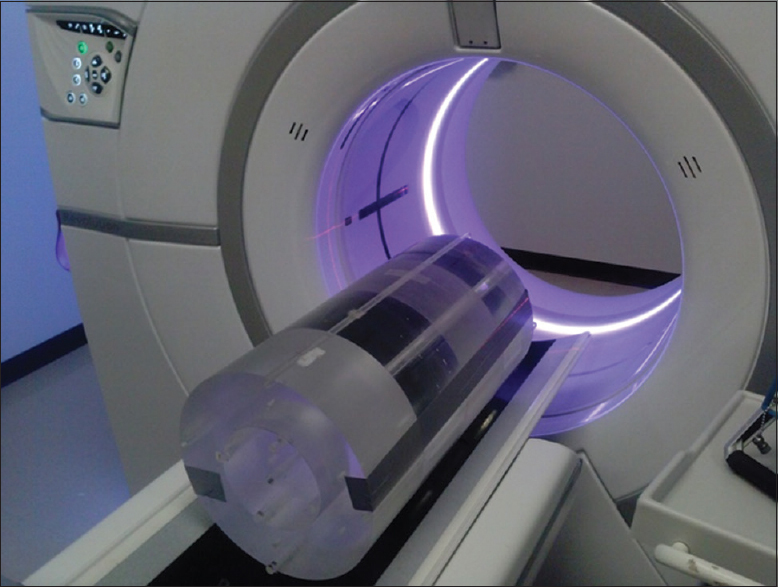 Experimental measurements were performed in a 256-slice GE Revolution CT scanner (GE Healthcare, Waukesha, WI, USA), whose beam width is up to 160 mm. Radiation doses were measured for single axial scans using ion chambers inserted into a 60 cm long PMMA body phantom with techniques of 120 kV, 120 mAs, rotation time of 1 s, and various collimations: 1 × 5 mm, 64 × 0.625 mm, 128 × 0.625 mm, 192 × 0.625 mm, 224 × 0.625 mm, and 256 × 0.625 mm. The phantom length of 60 cm was chosen since it has been proposed by Dixon , to use a phantom length of >47 cm to achieve dose equilibrium. Tube current modulation (Smart mA and Auto mA) was turned off. Each scan was done with a single rotation in volume mode. The doses at both the central and peripheral axes were measured. Weighted CTDI was calculated and compared with the displayed CTDI on the CT console. The 60 cm long PMMA body phantom was assembled by joining four standard 15 cm long PMMA body phantoms together [Figure 1]. The phantoms were joined together tightly and held in place by adhesive tape. Since the phantoms were machined, their contact surfaces are smooth and leave no gap for photons to stream through. Fitting rods were placed in the holes to align the phantoms and to provide rigidity. Pencil chamber measurements are first made in a single 15 cm body phantom and scaled with measurements obtained from pencil chamber DPI measurements of the primary CT beam in air according to the IEC method. 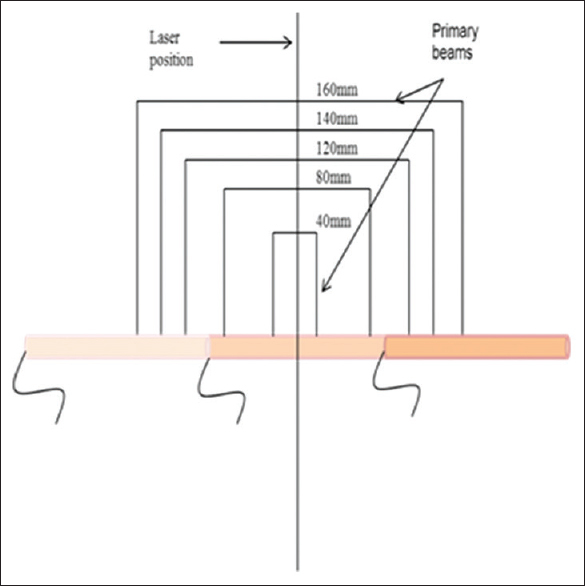 These measurements were also done at different beam widths using the previously described techniques. CTDI calculated from total dose measurements of DPI∞ above, at different beam widths, were compared to CTDI calculated using the IEC method. More details and [Figure 2] and [Figure 3] depicting the measurements are in later sections. Following the assembly of the 60 cm body phantom, dose profiles were integrated at different beam widths with each ion chamber to get the DPI∞. Integration is done by inserting pencil and Farmer ion chambers in the 60 cm long body phantom and moving the chamber to carefully measured locations corresponding to the active length of each chamber for each scan at different beam widths. More details and [Figure 4] and [Figure 5] depicting the measurements approach are in later sections. Finally, with the assembled 60 cm body phantom, peak dose measurements were made by inserting a Farmer chamber at both central and peripheral z = 0 locations. Single axial scans, using a single rotation, were done using the previously described techniques and different beam widths. Peak doses were plotted on a graph and extrapolated to obtain Aeq. The IEC method requires primary beam measurements in air. Primary beam measurements of DPI in air were done using the pencil chamber. The pencil chamber was lined up with the laser in the scanner, and different measurements were taken for single axial rotations for the scan technique of 120 kVp and 120 mAs (1 s rotation time). Using the methods depicted in [Figure 2] and [Figure 3], for each scan rotation, the pencil chamber was moved to the next position. These two methods were used to collect the primary beam measurements. 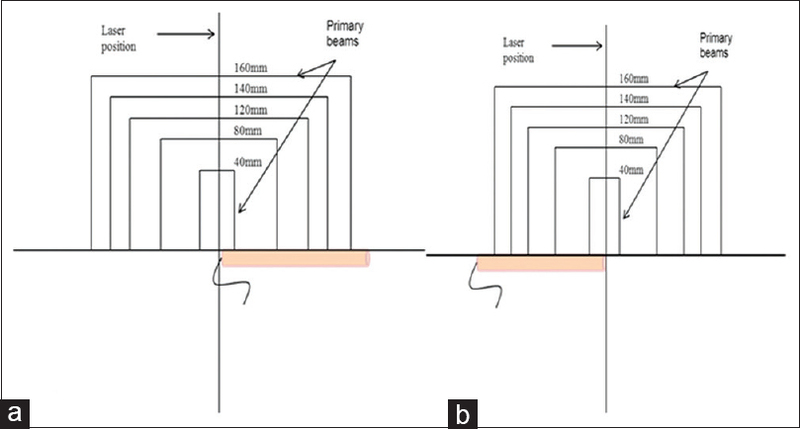 The approach described in [Figure 2] is recommended by the IEC, whereas the approach described in [Figure 3]a and [Figure 3]b is our unique approach for measuring the primary beam. Due to the geometry, two pencil chamber readings [Figure 3] were summed and converted to dose using the f-factor, 8.78 mGy/R. In theory, both approaches as shown in [Figure 2] and [Figure 3] give the same results, but the approach in [Figure 3] is easier to implement. Where CTDI100, beamwidth, is CTDI100 at any beam width, CTDI100,5mm is CTDI100 at the 5 mm reference beam width (the smallest available beam width on the scanner), CTDIair, beamwidth is CTDI measured in air at any beam width, and CTDIair,5mm is CTDI measured in air at the reference 5 mm beam width. The procedure described above for the pencil chamber was also followed for the Farmer chamber so as to collect the DPI∞ associated with the Farmer chamber, as shown in [Figure 5]. The scan technique used for both chambers was 120 kVp and 120 mAs (1s), with a single axial rotation with no table movement. Again, the use of infinite integration limits in the formula above was because the technique was chosen to allow the dose profile to converge at the largest beam width (160 mm) in the central axis of the body phantom. Note that this approach of using the pencil chamber or the Farmer chamber depends on using a large phantom that allows the scatter tails to converge to zero at large distances from the location of the scan. The scan was done without table movement and the detector is the only object moved from one end of phantom to the other for reasons outlined above. This approach is also analogous to the case of using a long 30 cm pencil chamber to integrate the dose profile from a 90 cm long phantom. In this case, three measurement locations would be used to capture the entire dose profile over the 90 cm long phantom. Optimization was done by taking the average of squared difference between the measurements and the model from our fit equation, and minimizing to zero by changing the parameters f(0), Hmin, and α. Hmin is the minimum measurement when the beam width a is zero, i.e., f(0)a=0. f(0)a is the measurement at some beam width a. f(0) is the peak dose Aeq as the beam width a becomes very large, i.e., f(0)a→∞. Hmin was constrained to be greater than or equal to zero, α was constrained to be <1, and a d corresponding to the ion chamber length of 23.1 mm was used. [Figure 6] depicts the data and the fitted curve. In wide-beam CT with no table translation, f(0)a approaches peak dose at equilibrium, Aeq, when beam width, a, approaches infinity. We note that in conventional CT with table translation, an infinite scan length is used to achieve equilibrium instead of an infinite beam width. Where a represents beam width in each formula. It must be mentioned that both DLP and DLI formulas represent the area of the region under the CT dose profile graph. DLP600 was calculated from DPI∞ measurements in an “infinite” (60 cm body phantom). However, DLI is not based on integrating the dose profile graph segment by segment, as was done for the DPI∞. 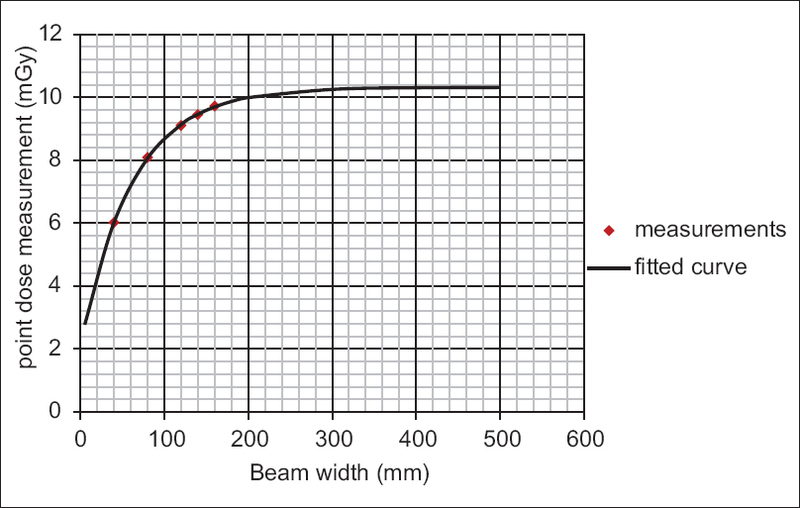 Rather, DLI is based on measuring the peak of the dose profile in the 60 cm (600 mm) phantom and multiplying this by beam width so as to obtain area. Because the dose profile in the 60 cm phantom converges, DLI can be related to the DLP600 calculated from DPI∞, since the peak dose measurement in the DLI includes scatter contributions from the ends of the phantom. 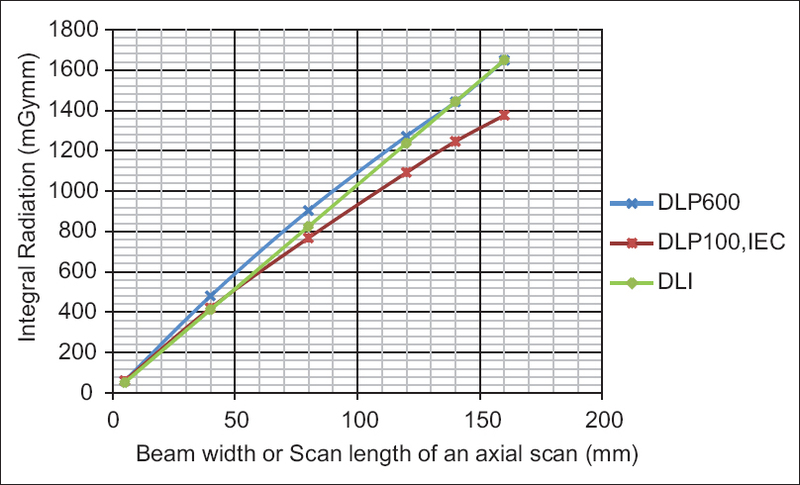 The fact that both DLP600 and DLI give identical results, as shown in [Figure 7], is a testament to the accuracy of the measurements in this article. Although both the Farmer and the CT pencil ion chambers measure ionization, the RadCal electrometer/pencil chamber combination was calibrated to read exposure in units of Roentgens (R), while the electrometer/Farmer ion chamber is typically calibrated to read ionization (charge) in Coulombs (C). A cross comparison of the Farmer ion chamber and the CT pencil ion chamber was conducted to determine the calibration factor (Nk(mGy/nC)) for the Farmer ion chamber. The Farmer and CT ion chambers were put side by side at the isocenter of the CT scanner, with both ion chambers extending beyond the table end to provide a relatively scatter free environment. The Farmer chamber is connected to a PTW (PTW, Freiberg, Germany) Unidose electrometer, while the pencil chamber is connected to a 9010 Radcal electrometer (Radcal Corporation, Monrovia, California). The free-in-air measurements were made by scanning over the entire length of both ion chambers using contiguous axial scans at 120 kVp and various mAs settings (from 50 to 250 mAs). A linear relationship between the exposure in Roentgen(R) by the CT pencil ion chamber and the charge in Coulomb(C) by the Farmer ion chamber was established and used for the conversion. The calibration factor (Nk) for the Farmer ion chamber was found to be 47.9 mGy/nC. Dose measurements with pencil-type ion and Farmer chambers at different beam widths in a 60 cm body phantom are shown in [Table 1]. Dose measurements in the air are also shown. The IEC method is done using pencil chamber measurement in a single body phantom at reference beam width of 5 mm and also in air at 5 mm reference beam width (1 mm × 5 mm). Calculated CTDI from the collected DPI∞ for both the pencil and Farmer chambers is shown in [Table 2]. The results of peak dose measurements with a Farmer chamber are shown in [Figure 6]. Since the 160 mm beam width on the GE CT scanner was not large enough to allow dose equilibrium to be reached, we extrapolated the data to obtain an Aeq of 10.31 mGy. This result is used to calculate DLI. [Figure 7] shows DLPs from the integration method together with the DLI obtained from the point dosimetry method. It is clear that the IEC (DLP100, IEC) method still underestimates the dose by up to 17.8% at the largest z-axis coverage of 160 mm when compared to the DLP method and the use of DLI. This study is important in highlighting the differences in CTDIs calculated from the IEC method and CTDIs calculated from DPIs obtained by integrating directly using various ion chambers. It is unique for using a 60 cm body phantom to simulate actual scatter at larger beam widths when measuring DPI∞. Using the IEC method to scale up the doses measured at the reference collimation, although simpler to use, underestimates the scatter contribution at larger collimations as this work shows. A calculation of percentage difference between the measured values [Table 1] reveals an average difference of 12.82%. In the absence of multiple phantoms for measuring total doses by the approach used in this article, we expect that total dose and CTDI values obtained from the IEC approach, for the 256-slice GE Revolution scanner, will be underestimated for larger beam widths. [Table 2] shows that the CTDI values calculated at different beam widths are comparable with measurements using the pencil or Farmer chamber. These CTDIs are also comparable to the CTDI obtained by the scaling method of the IEC. There is, however, a larger difference between CTDIs calculated from our measurements and CTDI displayed on the GE CT scanner console. This scanner displayed CTDIs in column 2 of [Table 2] are specified as CTDI z-max on the GE scanner. According to the GE technical manual, a 45 cm long phantom is assembled by placing three 15 cm long and 32 cm diameter body phantoms together. Measurements were obtained by placing a 100 mm pencil chamber in the center phantom of the 45 cm long body phantom, at the central and peripheral locations, and the phantom scanned to measure the dose. CTDIs are then calculated from these measurements for different beam widths. This approach underestimates the doses measured by ignoring the scatter tails of the dose profile, which likely explains the low CTDI values reported on the GE scanner console as the beam width gets larger. Our approach of integrating the dose profile, as described in this article, captures the entire dose profile and is therefore an accurate representation of actual output of the GE scanner. Several papers have described similar approaches to ours, of integrating the total dose profile, by either moving the detector or moving the phantom while the detector was kept fixed.,, In TG111, a “point” detector is used to measure DL(0) at different scan lengths or beam widths, and the result is plotted on a graph and used to determine Aeq by fitting various parameters. Using this approach, we obtain Aeq of 10.31 mGy according to results as plotted in [Figure 6]. Using this Aeq value and multiplying by beam width a, we obtain DLI values as plotted in [Figure 7]. It can be seen in [Figure 7] that the TG111 method of requiring dose equilibrium (Aeq) is close to dose measurements by actual integration of the dose profiles (DLP600) by the methods used in this paper. Both the TG111 and IEC methods have limitations. The TG111 methods still require measurement in a phantom large enough to allow dose profiles to converge at the tail ends of the phantom. This is a problem for many institutions where multiple phantoms may not be readily available. The IEC method while easier to implement does underestimates the dose indices at larger beam widths as shown in this work. This is likely due to the increased scattered radiation at larger collimations or beam widths when a larger phantom is used, compared to scaling measurements with a 15 cm phantom. It is expected that the difference will be smaller when head phantom measurements are made, due to the smaller scatter produced in a head phantom. By comparing the scaled CTDIs in column 4 of [Table 2] that were obtained from the IEC approach and the CTDIs in column 3 of [Table 2] that were calculated from the direct method of measuring DPI∞ in the 60 cm body phantom, an interesting result emerges. The DPI∞ dose measurements in a 60 cm body phantom show that the CTDI is larger and may be more representative of the total dose at larger beam widths. This is because with four body phantoms, the actual exposures, and hence, DPI∞ doses measured at different beam widths was larger, likely due to the increased scatter provided by the additional phantoms. The percentage difference between the two values is <20% at all beam widths. This shortfall, although <20%, is a limitation of the approach described in the IEC document since the single phantom used for measuring the reference dose cannot simulate the extra scatter from the additional phantoms used in this study when larger beam widths are involved. The calculated CTDIs obtained from measured data are larger than the CTDIs displayed on the GE CT scanner console. CTDIs measured directly in a 60 cm body phantom for both pencil and Farmer chambers compared well with the CTDI measured using the IEC approach for the pencil chamber, although the IEC approach underestimates the total doses and therefore the scaled CTDI values at larger beam widths. For a CT scanner with wide z-axis coverage, the scaled method promoted by the IEC is the easiest and most accessible method for accurately measuring CTDIs. On the other hand, the use of a point dosimetry method proposed by TG111 to obtain DLI accurately predicts the integral dose when a long enough phantom is used, as evidenced by its closeness to DLP600, obtained by actual integration of dose profiles in a 60 cm body phantom. We want to thank Dr Angela Bruner and Dr Michael Wayson, for reviewing the manuscript and providing useful comments. We also want to thank Dr Ian Hamilton for lending us two body phantoms. Shankar JJ, Lum C. Whole brain CT perfusion on a 320-slice CT scanner. Indian J Radiol Imaging 2011;21:209-14. Xyda A, Haberland U, Klotz E, Bock HC, Jung K, Knauth M, et al. Brain volume perfusion CT performed with 128-detector row CT system in patients with cerebral gliomas: A feasibility study. Eur Radiol 2011;21:1811-9. Hsieh J. “Computed Tomography Principles, Design, Artifacts, and Recent Advances”. Bellingham, WA: SPIE 2009. Shope TB, Gagne RM, Johnson GC. A method for describing the doses delivered by transmission x-ray computed tomography. Med Phys 1981;8:488-95. IEC. Medical electrical equipment – Part 2-44: Particular requirements for the basic safety and essential performance of X-ray equipment for computed tomography. IEC; 2016. Dixon RL, Boone JM. Cone beam CT dosimetry: A unified and self-consistent approach including all scan modalities – With or without phantom motion. Med Phys 2010;37:2703-18. TG 111, Comprehensive Methodology for the Evaluation of Radiation Dose in X- Ray Computed Tomography. AAPM; 2010. Mori S, Endo M, Nishizawa K, Tsunoo T, Aoyama T, Fujiwara H, et al. Enlarged longitudinal dose profiles in cone-beam CT and the need for modified dosimetry. Med Phys 2005;32:1061-9. Dixon RL. A new look at CT dose measurement: Beyond CTDI. Med Phys 2003;30:1272-80. Dixon RL, Ballard AC. Experimental validation of a versatile system of CT dosimetry using a conventional ion chamber: Beyond CTDI100. Med Phys 2007;34:3399-413. Spokas JJ. Dose descriptors for computed tomography. Med Phys 1982;9:288-92. Dixon RL, Boone JM. Dose equations for tube current modulation in CT scanning and the interpretation of the associated CTDIvol. Med Phys 2013;40:111920. Dixon RL, Munley MT, Bayram E. An improved analytical model for CT dose simulation with a new look at the theory of CT dose. Med Phys 2005;32:3712-28. Weir VJ. A model of CT dose profiles in banach space; with applications to CT dosimetry. Phys Med Biol 2016;61:5020-38. Lin PJ, Herrnsdorf L. Pseudohelical scan for the dose profile measurements of 160-mm-wide cone-beam MDCT. AJR Am J Roentgenol 2010;194:897-902. Nakonechny KD, Fallone BG, Rathee S. Novel methods of measuring single scan dose profiles and cumulative dose in CT. Med Phys 2005;32:98-109.